Createspace Independent Publishing Platform, 9781533614476, 230pp. From National Bestselling author Jennifer Fischetto comes the second installment in her hauntingly humorous Gianna Mancini Mysteries series... Gianna Mancini does not have your average problems. Sure, her family is loud, her love life complicated, and her career still struggling to get off the ground. But Gianna has unique problems too...she sees dead people. And when a small explosion happens not far from her home, Gianna discovers the ghost of Thomas Sterling, son of the Sterling automotive empire. He refuses to move on to the afterlife until Gianna tells his fianc e, Serena, that he loves her. Not one to let the dead linger, Gianna locates the woman and passes on the message...but nothing is ever as simple as it seems. One message from the beyond turns into a warning to the very much alive, and Gianna suddenly find herself trying to keep Serena safe. Between her duties to the dead, auditioning for a singing gig, and trying to get rid of Freezer Dude, a pesky ghost from her past, Gianna has her hands more than full. With help from her boyfriend, Julian, and her cop brother, Enzo, Gianna needs to find the killer fast...before she end up on "the other side." Note: This work was previously published under the title Two Ghost & a Love Song. 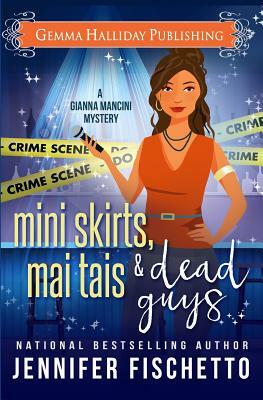 Gianna Mancini Mysteries: Lipstick, Lies & Dead Guys (book #1) Miniskirts, Mai Tais & Dead Guys (book #2) Christmas, Spies & Dead Guys (holiday short story) What critics are saying about Jennifer's books: "It grabbed me by the hand and pulled me in, not letting go until the very last page. Highly recommended." Melody's Bookshelf on "Unbreakable Bond" "Weaves mystery with laughs (and a few tears). This delightful tale is a definite read I would read it again as well as the rest of the series." Should You Read This Book? Review Blog, on "Secret Bond" "The characters are always so well written. They feel like they could pop off the page. I can't wait for the next book in the series " Wakela's World on "Secret Bond" "I approached this book with the idea that it would be the light reading many of us look forward to enjoying in the summer. It turned out to be more than that and I couldn't put it down." The Birch Bark on "Secret Bond.